Multicolor set of 8 Zig Illumigraph Medium Chisel Point Wet Wipe Markers. White, Fluorescent Violet, Fluorescent Red, Fluorescent Light Blue, Fluorescent Green, Fluorescent Pink, Fluorescent Orange and Fluorescent Yellow. 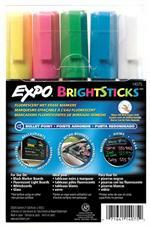 EXPO® Bright Sticks® Wet-Erase Fluorescent Markers, Assorted Colors, Yellow, Pink, Blue, & Green. EXPO® Bright Sticks® Wet-Erase Fluorescent Markers, Assorted Colors, Pack Of 5 - Yellow, Pink, Blue, Green & White.